We know Girl Scouts work hard to give back to their community and we are a resource for you and your troop when it comes to Art. Girls Scouts of all ages can attend a workshop, class, or camp at Yellow Door Art Studios, earning badges and becoming confident as Artists! Any Art Badge can be earned at Yellow Door. Troop leaders can schedule a two-hour workshop during their regular meeting time. Cost is $15.00 per girl if the workshop is held at Yellow Door or we can come to your meeting place for $20.00 per girl. We love celebrating the end of a scouting season with troops. To book a 2 hour Art Party at Yellow Door, email yellowdoorartstudios@gmail.com. Cost is $175.00 for up to 10 girls. Yellow Door provides the art project, end of the year goody bags for scouts, and all paper products for troop party. 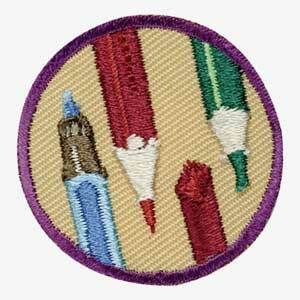 Summer is a time where girls may earn a badge on their own. At Yellow Door, Girl Scout badges can be earned at any of our summer art camps. We offer ½ day and full day art camps every summer AND you get to use your girl scout discount (enter yellowdoorgirlscout for $25.00 discount). Summer camps can be found by clicking here!